Someone recently remarked to me that you can think of hardware as software that’s developed really slowly. While the software space has been going wild over cloud computing it’s been pretty quiet on the hardware side of the equation. But, that’s going to change as we see a new class of server hardware that helps businesses take advantage of the power and density savings possible through new CPU architectures and software stacks. As an illustration IDC reported on the server market recently and it shows the start of the next wave of change. As you’d expect the general server market is pretty poor, growing at just 2.7%. But, blade servers which are commonly used for Web workloads is growing at 7%. Finally, the hyperdense form-factor is growing at 29% – which is an astounding amount. In some ways the drivers for this change are just the continuation of a long-running story where everything is (has?) moved into a Web infrastructure set-up which enables the horizontal scaling of services. Implicitly this favours buying a lot of cheaper systems and building in redundancy at the software level. But the Cloud accelerates this trend further since it’s stateless and you no longer care about the specifics of the hardware layer in the same way. The challenge for infrastructure managers is that continually adding more servers means you’re incurring ongoing costs for electricity, space and management. So anything that can drive better performance per watt in a denser arrangement is interesting. As you can see from the diagram below the expected growth in this space is really significant. At a CPU architecture level ARM chips have been getting more powerful and this year they’re going to enter into the mix for servers. The first reason for this is that they’re relatively low-power which means lower running costs. Since they’re low power they also give off less heat so another advantage is they can be put into a ‘hyperdense’ arrangement that also saves money in terms of space. You’ll see systems this year from both Dell and HP (see Moonshot). It’s pretty astounding to think that the same chip that’s powering your phone could be powering Facebook! If we’re truly going to get the benefit from the new hyperdense form-factor then the software layer will also need to reflect the capabilities of these systems. So for Ubuntu we’re continuing our work on ARM and recently announced the availability of 12.04 LTS as an ARM server – the first commercial Linux to come to the platform. We’re also exploring how these hardware systems unique strengths are expressed and how this impacts the software stack. For example if you’ve got a few hundred systems in a half-rack then the problem of managing those systems is far more significant – so service orchestration (such as Juju) is really critical. It’s exciting times in this space and a really interesting project. If you’re interested in a quick summary of ARM server check out this Prezi by Victor Palau. I’m pretty much tied to my laptop, not only does it have all my applications on it but I think I might be so habituated that I can’t usefully think without having it’s warming reassuring whirr on my lap. Of course like all mobile workers I’m always worried about how much time I have left in the battery, in fact I’m so paranoid that I’ve developed frown lines from constantly scowling at the battery indicator as it slowly dribbles down to the moment when I’ll be disconnected from the world-wide-‘like’-a-sphere! It’s one thing to watch it dribble down when you’re working, but how much worse when you ‘resume’ the laptop to find that half the battery has gone already! Equally, doing a full hibernate is great from a battery perspective but the ‘resume’ takes a long time to get to which isn’t fantastic if you’re just moving from say one meeting room to another. In Ubuntu 12.04 LTS we have the answer with hybrid suspend. If you’ve ever had a Mac OSX laptop then you’ve seen this capability before. Essentially, when you close the lid the system initially goes to suspend, and then after a few minutes it drops into hibernate so you’re no longer using any power from the battery. One capability the Mac has is to resume from hibernate really quickly, not quite sure how they do that – if you know I’d be interested. Hibernate takes a while to get back to your previous state because it has to read the system image back from the disk. Equally, with plain suspend you’re using a trickle of battery to keep the system quietly ticking over so it can resume a lot faster. So when you’re using the hybrid system you want to set it to hibernate when you’re not going to be using the laptop for a while. I set it to go to full hibernate after 15 minutes. $ sudo pm-is-supported --suspend-hybrid && echo $? If it returns 0 then suspend-hybrid can be used with this system. Create the hybrid suspend capability by creating the /etc/pm/config.d/00-use-suspend-hybrid file. It should now use hybrid suspend and put the system to full hibernation after 15 minutes. There’s some more power saving information in the Ubuntu Wiki, and the original source of the idea was from Daniel Hahlers post. Canonical is looking for a business product marketing manager to lead the marketing of our portfolio of enterprise products and technologies. The objective is to increase the profile, market penetration and user-base of Ubuntu’s business products such as Ubuntu Cloud Infrastructure. All technology companies face the problem that they think in terms of tech, but users think in terms of how a product benefits them in their specific situation. This often leads to a sales and marketing gap. In Canonical’s case Ubuntu is an operating system platform that’s used by a variety of consumer and enterprise audiences. Although our server and Cloud products are generally for enterprise users, there’s over-lap in the desktop area which is used by both. So the product marketing manager role will market Ubuntu products to businesses and organisations – whether global enterprises, academia or government. Technology companies tend to subtly vary the way product marketing is defined, and particularly the line between product management and product marketing. As an aside there’s a nice article at Silicon Valley Product Group about this. In Canonical product managers are responsible for defining the strategic direction for a product and work closely with the engineers who are developing and delivering the technology. The product marketing managers are part of our marketing and communications department with the responsibility for defining and leading the marketing activities. By definition the two roles are closely related, but product marketing is inherently focused outwards communicating the benefits of the products to prospective users. In order for Ubuntu to succeed in an enterprise the benefits must be clear to both the technologists (e.g. Sysadmin) who will implement it, and the management decision maker (e.g. CIO) who will sign-off its use. Consequently, our marketing activities speak to both audiences, though with more focus on technologists. On a day-to-day basis we’re a pragmatic organisation where everyone rolls their sleeves up and gets on with it. So you’ll need to use quantitative and qualitative approaches to identify addressable segments for marketing programmes. You’ll work with product management to create and polish propositions and with other members of the Comms team to form messaging. You’ll then put together marketing programmes that achieve the best ROI, iterating and improving how we reach the segment as necessary. In many instances you’ll want to take advantage of ways we can team-up with our passionate advocates to get the message out. Canonical is a deep technology company so to be successful in this role you need to be excited about the technologies we’re developed and capable of understanding and communicating their advantages. You’ll understand how the Cloud is revolutionising enterprise IT and be able to clearly communicate where, why and how it’s impacting DevOps. Ubuntu is a key part of that equation so you’ll understand how our technologies, such as Juju, are part of that revolution. Importantly, you’ll act as a bridge to enterprise users, explaining the features and benefits of these products in the context of the challenges they face. You’ll need the capability to clearly explaining technologies, understanding the business problems they can solve for customers and undertaking marketing activities to communicate this. The next year is full of challenges and opportunity. In April we’ll be launching 12.04 LTS which is a major enterprise release and the spring-board for our activities in the business segment over the next two years. We’re focused on expanding Ubuntu’s use in the public cloud where we are the most popular OS on platforms like Rackspace Cloud and Amazon Web Services. We believe that private and hybrid clouds will be an important part of the future for enterprises and we’re working with partners such as HP and VMWare to help them get the most from Ubuntu Cloud in their data centres. In other words it’s an important moment and we’re full steam ahead! As an open source company our first challenge is to make sure our products are widely known and used in a playing field where proprietary vendors can outgun us in marketing spend. So the measure of success in this role is whether Ubuntu is increasing market penetration compared to the large proprietary cloud vendors such as Microsoft and Oracle. Having built-up an extensive user-base the product marketing manager also works with field marketing to convert users into customers for commercial services such as Ubuntu Advantage. At a personal level Canonical is a dynamic organisation so you’ll need to be entrepreneurial, high-energy and collaborative – your colleagues are based around the globe ranging from offices in Taipei to being sat at home in California. I think the biggest reward will be to work with an amazing set of people at one of the most innovative technology companies around, during a time of massive industry change. If that sounds like heaven then get your application in ponto! I attended GDC Europe 2011 in Cologne back in August. If you haven’t run into GDC previously it’s the main games developer event in Europe and comes just before Gamescom which is an absolutely gigantic. The most interesting topic of conversation was that we’re in a period of considerable change for the games industry as online and the Web become increasingly important. In a panel discussion Martin de Ronde of Vanguard Games summed it up by pointing out that what’s most confusing for the industry is that the period of transition is unclear. But, that the eventual outcome will be a future of many screens, with many platforms and that the aim for developers has to be to provide players with the ability to play anywhere and any time. For Ubuntu this is a very positive perspective as we know we’ll be on many devices and form-factors. I sat in lots of talks and panels about on-line gaming and the Web – the speed and velocity of change is clearly still controversial. The general perception is that the Web isn’t quite ready for Core Gamers but that it could get there very quickly. Aside from the buzz around online games the other issue is the impact it has on development costs. In one talk about publishers it was pointed out that a PC game costs 2-3 million to develop, while a console game is 8 million (!) or above. Meanwhile, an on-line game will be considerably cheaper at around 500k. The primary reason given for why Web games aren’t ready is the lack of bandwidth which makes it difficult to deliver a high production value. One insightful point was that the technical limitations mean it’s useful to think about specific genres since some will be easier than others to put on the Web. The costs and revenue potential is also very different, with the opportunity to do long-tail revenue with an online game. For me an implicit issue is that the software stack around “HTML5” is still immature so you’re bound to see issues and incompatibilities – this is probably something that we in Ubuntu have felt the full pain off in the past with Flash! So where are the opportunities for smaller developers? Well everyone seems to agree that digital distribution is revolutionising the way in which developers can reach players. And that this change is going to be across every player segment and on multiple different plaforms. However, the challenge for developers is that they’ll need to form a relationship with players and do some of the things publishers have previously done – market and sell their game. Luckily the Web is a great platform for this. From an Ubuntu perspective GDC confirmed that digitial distribution is now considered mainstream, so everything that we’re doing in Software Center and our developer programme is timely. For the future it seems clear that the Web is going to be a major gaming platform which will benefit Ubuntu users as it offers the promise that they can play on an equal footing to everyone else. Clearly, we’ll want to look for ways to influence and get our voice heard on aspects of the technology stack, since it will impact our users in the future. Moreover, our experiences as an alternative platform contain valuable insights for those developing and choosing the future software gaming stack. Phew! so GDC was great, though it was a bit of a culture shock. Particularly, on the last day when I blearily made my way into the convention centre and in the corner of my eye caught three camels walking along the road – it made me jump in surprise! It turned out they were for free rides during Gamescom. Only at a games conference do you get that sort of marketing! Recently I attended the gaming conference Develop 2011 in Brighton. Digital entertainment (movies/music) is something Ubuntu users are excited and interested in. This means there’s an increasing opportunity for developers to create applications that those users want. So understanding the challenges, concerns and opportunities the gaming industry faces and how that might apply to Ubuntu was my focus during the conference. Perhaps the most immediate thing that struck me is the burgeoning importance of online games. Nick Parker gave an interesting talk on funding development. The slide that stood out the most was one that showed ‘core gaming‘ (think PS3) has now peaked and that online (casual, MMOG, mobile and social) gaming is the real driver of growth for the industry. He pointed out you’re still talking about a core gaming market that’s hundreds of millions of dollars in size but nonetheless the traditional vendors haven’t yet grasped the online opportunity. Generally, it’s difficult for new platforms to break through into games developers consciousness. At a basic level creating games is risky and expensive so develpoers target platforms with the maximum possible number of sales. To some degree online games offer a way out of this conundrum for alternative platforms: if the browser is treated as the platform then all operating systems have an equal chance. The devil is in the detail depending on the technologies used, Flash is fine from a Linux perspective, WebGL could be great but plugins (such as Unity browser plugin) are more of a problem. Perhaps the best talk I saw which combined these trends was done by Ikka Paananen who talked about the opportunities for immersive play within the browser. If you want to find out what he means try Supercells game Gunshine which works in a browser on Ubuntu just fine – in fact I lost a Sunday afternoon to it! There also seems to be a lot of optimism about the opportunities for interesting games development: a lot of positive commentary around the opportunities around despite the wider economic conditions. A big part of this was around Indie development, with small teams able to create so much for a relatively small level of investment. A talk by Tony Pearce about raising cash for your game (supported by NESTA) illustrated this, not only was it a great talk but it was absolutely packed with developers. Reinforcing the positive theme was a very motivating keynote given by Michael Acton Smith the CEO of Mind Candy, the company behind the super-hit Moshi Monsters. First, I’m embarassed to admit that I hadn’t heard of Mosh Monsters, it turns out that if you’re a parent then you know all about them – it’s that big! Of course, he was head-lining because it’s such a massive hit and with a suitably dramatic story where at one point they almost burned out. But, much of his talk’s insight could have been applied to any start-up or group creating new products. I heard two key things, one was that you you should explore the boundaries of your space with creativity, the other one he didn’t say directly but I was struck by how deeply he’d thought about the mechanisms and drivers that power his business. From a pure inspiration perspective the main sense was the essential energy the team brought to the journey as they explored (and continue to explore) creating something for their users. So there it is – explore creatively, think deeply and be energised! 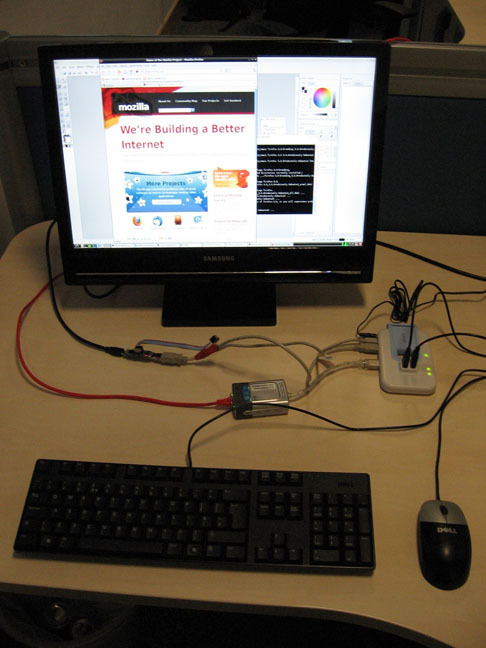 Raspberry Pi – The BBC B for a new generation? Raspberry Pi is a project to spark exploration, innovation and to create a new generation of programmers by putting a computer into the hands of every British child. That was the passionate vision presented by David Braben of Frontier Development at Develop in a talked labelled “Giving something back”. There are some interesting parallels with the vision One Laptop Per Child (OLPC) had. The radical difference is that with the effects of Moores Law since the OLPC project the Raspberry Pi vision is for a device that costs 15 GBP – that makes it realistic to put one into the hands of every child in the UK! The starting point for this endeavour is that children aren’t excited by Computer Science in the UK any more and that this has meant a radical drop in the number of University applications. There’s a shortage of precise figures, said David, but it could be as much as a 51% drop since the mid-90’s. He cites a lot of reasons for this, from changes in life-style, curriculum and the mass-media. His conclusion is that a key shortage is a computing environment for kids that encourages programming – a BBC B for a newer generation. The team aims to create a small (phone sized) computer, powered by an ARM chip, which you can plug a TV/keyboard into and a software load with educational software on it. The long-term mission being to provide these free to groups of children with appropriate content, along with management capabilities for teachers. The bottom line for me is that encouraging experimentation, exploration and creation is a good thing in and of itself. If you want to create programmers they have to start along the journey of realising that you can create as well as consume in the digital world. When I was in school computers were all the rage from an educational perspective and certainly while we mostly played games we also created small programs. Like many others I spent long hours typing out program listings that came in magazines, and learnt rudimentary concepts in BASIC. While I personally took an indirect path into computers I do think these experiences were formative in accepting what was possible and sparking an inherent interest. Creating a complete computing environment for children and teachers is a hugely ambitious goal. You have to solve hardware, software, content and distribution problems along the way. At the moment the Raspberry Pi team is focusing on the hardware, with an initial developer version due this year. I see the software stack as being a critical portion – you’ll be glad to know that Ubuntu is the OS! It has to be said that although I got into computing with BASIC and a manual I don’t think that’s going to cut it for kids these days: it certainly wouldn’t have cut it for me if there’d been anything like the Net! Moreover, I think we have to accept that the Web is the platform and that the elements of sharing, socialising and interacting are all part of what makes up computing now. So any software stack has to look forward and encompass new elements even when trying to be simple. That said I think the software and languages we have today are a lot stronger and more compelling: whether that’s languages like Python or some of the OLPC environment! Of course, it’s easy for a technical audience to focus on the technology stack but this changes all the time, what’s more important is the content and education contacts. Clearly, the content will need to address childrens needs at different ages, and working with the education sector so that it fits their needs and understanding is going to be very important. David noted that managing groups of machines was a key need for educators who aren’t technicians. I was struck by the passion and willingness to get involved throughout the room – if that passion can be harnessed it will hold the project in good stead. I’ve love to see Raspberry Pi develop into a full charity with funding from the industry and efforts to work with the education sector. If you’re like to find out more about Raspberry Pi, and perhaps sign-up for one of their dev boards, then see their site. What do you think about this initiative and on a more general level how can we help get kids involved in experimenting with technology? I don’t know if this targets Microsoft, I do know that Apple has done as much as anyone to make the network a central part of our digital life. It’s clear that we all spend more time online – if you stand-back you can see see our increased dependence on the Web (we spend more time on-line than watching TV), along with how central some web apps are becoming to our lives (from Facebook to Google calendar). You might question how quickly this is happening or how widely spread: there’s not much bandwidth in Africa, and I often find it surprising how poor connectivity is in rural areas. But, that’s just a question of timing – large numbers of users already think of their computers and the Web as being synonymous. The Web itself is rapidly becoming the standard development platform and storage medium for applications. With HTML5 and its’ extended technologies we will see increasingly complex and capable web apps: this Financial Times HTML5 app is a nice example and tweaks Apple’s tail! Even if the interface of everything can’t be a Web front-end, then data storage is also moving in that direction: increasingly users think of their content as being ‘available’ everywhere – meaning online. From a user perspective this means we all expect to access our favourite applications and our personal data at any point from a myriad of devices. The impact on Windows is that the field is being reset, both at a software and a hardware level. Microsoft is not a cherished consumer brand that everyone loves so they will have to start over. But, it equally impacts anyone that wants to create a general operating system – Ubuntu being my concern. If everything is on the network, and the network provides many of the applications then there’s going to be a fundamental set of shifts in how the system stack supports the user. Among the many areas, two things stand out for me. The first theme is that we need to provide ways for users to store and access their content online. We’ve seen Apple’s system, we’re bound to see systems from all the titans of the industry as well at a lot of start-ups. This could be fantastic for users, but there’s also potential for drawbacks if there’s no standardisation – we don’t want to go back to a world of locked in data. But it’s deeper than data, users don’t think “I need my data” they think “I want my photos of Nancy the dog” which means we need to attach storage and applications together. That’s why in Ubuntu One we talk about the personal cloud and we’re providing both applications and API’s to build on top of basic data storage and sync. Any data storage (including Ubuntu One) also needs to be available across multiple platforms so that our users can access their content whenever they want or need it. Importantly, to make the Cloud the central storage location it needs to be fully integrated and seamlessly part of the users experience – going to the ‘Web folder’ is a fail! The second theme is that the operating system will be a window onto the Web, and this changes what it needs to present to the user and the services it provides to applications. From a user perspective we need to integrate the Web so that there’s no difference between local and network applications. Moreover, some of the metaphors of the Web are impacting how users think about interacting with their computers, take search as an example. For applications to be truly integrated it will mean that the system stack will need to provide services that web application developers can use. For example, rather than signing into a myriad of different web applications how can the system stack authenticate me to them seamlessly. Perhaps even the idea of local and web apps will need to disappear, if we can provide technologies that help web application developers create applications that work both locally and through the network. A final thought, I said at the start that Apple has done as much as anyone to make the vision of a connected world real. But Unix and Linux has done even more – network computing is central to our technology, and distributed community is central to our ethos. For me this means Ubuntu has great strengths it can draw on as we create this future – Ubuntu can be the operating system for the rest of us in a connected world!